On the evening of 12 Oct 2017, I went to bed as normal but noticed I didn't feel comfortable in bed. My heart was racing and I got a sense of discomfort every few seconds. Eventually I got up and moved to the spare bedroom on the other side of the house and was able to sleep. 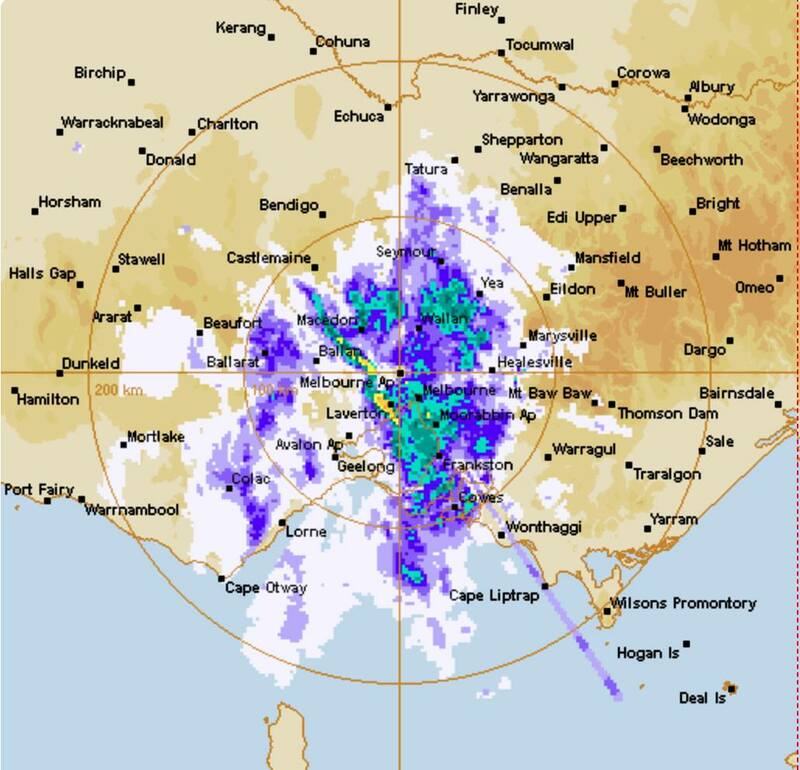 A few weeks ago, the regular Melbourne metropolitan weather radar at Laverton was taken offline and the training system at Broadmeadows was made 'live' to cover the period while the Laverton station was upgraded. From my location in the Dandenongs, Broadmeadows is 10kms closer than Laverton (40 kms vs 52 kms). The line-of-sight angle to Broadmeadows is also different, directed more towards me at sleep while the Laverton site is somewhat shielded by a brick wall. So the question arises - is my discomfort caused by the weather radars, and is it worse because of the passing storm? The primary radar site covering the Melbourne metropolitan area is closer to my house and is more directly in line-of-sight as I sleep. Is the replacement radar system the same as the previous one or are there differences in the radiation profile, radiation strength? Was the replacement radar 'usually' working prior to the primary site being taken offline? We live on top of a hill, so a radar looking for rain activity will be directed upwards, potentially directly to where I live. Is it possible that a weather radar adapts it's signal profile if a rain event is passing through the area, potentially increasing signal strength to penetrate rain clouds better? To try to get some answers, I put some questions in to the Bureau of Meteorology and was very pleased to get answers from Andrew Collins, Head of Radar. Here are the emails. Thanks for taking my call earlier. 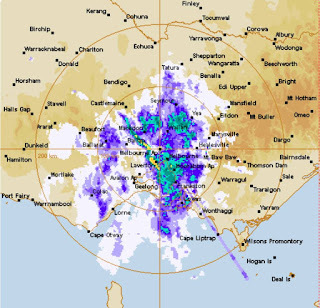 I am interested to know some more about the weather radars that are active in the Melbourne area. I understand that the Laverton centre is being upgraded and that the Broadmeadows centre is the primary site at the moment. I found this 'explainer' video on Youtube https://www.youtube.com/watch?v=YeLRr56K7UA so perhaps Steven McGibbony is the right person to be in touch with? My questions are of a technical nature about the radar systems that are active and which are being deployed, in particular some more in-depth information regarding the radar signals being generated by each centre and the radio-frequency emissions. - what are the makes and models of the radar units? Are there specification sheets that can be provided? - what are the power ratings of each unit, and under what conditions would power emissions be increased? - what are the rates of rotation of each unit? The Bureau uses several types of radars. We operate both C-band and S-band. Magnetron transmitters at 250kW (C-band) and 850kW (S-band) and 750kW klystrons (Meteor 1700S radars). Our scan rates vary as we generally do 14 elevations over a 6-minute or 10-minute scan strategy. Buckland Park (Adelaide) for example - Long Range Scan: Single elevation angle (0.5º) at 400 Hz PRF. Maximum range of 375 km for extension of reflectivity products. Dual Polarisation mode: 14 elevation angle scans, 1000 Hz PRF, second-trip recovery. Maximum range up to 300 km, restricted to a maximum observed altitude of 20 km (i.e. maximum range decreases with increasing elevation angle). Elevation angles scanned: 0.5º, 0.9º, 1.3º, 1.8º, 2.4º, 3.1º, 4.2º, 5.6º, 7.4º, 10.0º, 13.3º, 17.9º, 23.9º, 32.0º. The hyperlinks below are our two current radar OEM with basic commercially available specifications. If you need any other information please contact me directly. Thank you for getting back to me so promptly, Andrew. I very much appreciate the information. My interest is particularly in the RF emissions from the radars deployed within the Melbourne area and in particular how the changes in the active sites and upgrades to existing sites (Laverton) can be expected to change the profile. Specifically, the Laverton site was removed from operation and the Broadmeadows site made primary as the Laverton site gets upgraded. Were Laverton and Broadmeadows running the same systems or are their any differences? Can you share any information about the old-vs-new equipment being deployed into Laverton? I also have a question regarding the operation of weather radars, particularly as storms come through. The challenge for a weather radar system is achieving range during storm activity, as the water in the clouds and rain absorb the signal. Therefore does the system adapt the strength of the transmission signal dependent on the conditions? i.e. if an accurate signal for distant locations can't be obtained due to clouds closer by, does the system increase transmission levels to compensate? And conversely, if conditions are favourable, does the system decrease transmission strength? Broadmeadows radar is a C-band (5607MHz) 250kW magnetron running at 1000Hz PRF with a 1µS pulse. Laverton radar is a S-band (2880MHz) 750kW klystron running at 1000Hz PRF with a 1µS pulse. Please bear in mind as this radar has recently undergone dual-polarisation upgrade, it will emit 375kW out of the vertical and horizontal channels respectively. Therefore, EIRP is reduced by 3dB. This is the only recent change. Whilst you may of never saw Broadmeadows on the web before it has been alive and kicking in a training role. It was made live to cover for the Laverton upgrade. No, the output power remains constant in all conditions, obviously receiver gain varies with range. S-band have much better penetration and less rain attenuation than C-band but a little reduction in resolution. Thank you for the detailed update, Andrew. I presume simultaneously rather than in 2 separate passes? In September 2017, ACMA announced a consultation process regarding consideration of using mmWave frequencies for mobile broadband applications in Australia. Specifically this means 5G technologies at 26GHz, with other frequencies to be considered. This is part of fast-tracking the spectrum auction and accelerating 5G roll-out across Australia. I contact you today to raise my concerns that the commercial drum-beat to auction off the 5G spectrum is being fast-tracked without adequate safety standards having been established. This is clearly a case where commercial interests and the dangling carrot of billions of dollars in spectrum revenue are combining to over-rule any concerns regarding adequate protection of public safety. The properties of 5G radiation of 5GHz and above are totally different to that of 3G/4G and previous iterations of mobile technologies. Due to their higher frequencies, 5G waves cannot penetrate solid objects including human bodies, resulting in maximum absorption in the outer skin layers, eyes, ears etc. These organs are not inert, containing for instance T-cells which form a primary component of our immune system. The international technical committee which oversees the testing methodologies for microwave radiation - IEC technical committee TC 106 - has not even established a process to start defining safety measurement protocols for 5G radiation, let alone feed into the ICNIRP/ARPANSA process to establish safety exposure limits. ICNIRP does not consider 'biological' impact when setting safety limits, only thermal effects and considers skin to be a 'secondary organ' despite it's key role in blocking 5G radiation. ICNIRP is demonstrably corrupted by corporate vested interests. 5G mobile technology roll-out needs to be brought in check to avoid a health and well-being catastrophe for this state and our nation, brought about by the greed of government revenue-raising and corporate vested interests. I look forward to hearing from you on these matters. I refer you to a blog post I wrote in November last year, having witnessed the debacle at the annual 'Wireless and Science' event at RMIT, noteable for the cavalier disregard for actual scientific process.